Cassidy Ivanoff and her father, John, work at the new and prestigious Curry Hotel outside Mt. McKinley. While John will be expedition and wilderness exploration guide for the wealthy tourists, Cassidy has signed on as a cook's assistant. Both are busy as the hotel prepares to welcome the president of the United States on his way to drive in the golden spike to officially complete the railroad. 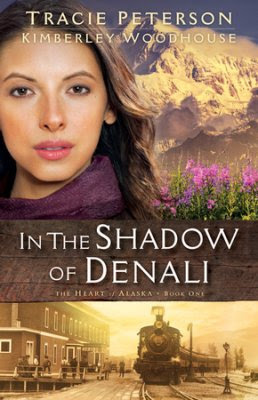 Allan Brennan travels to the Curry Hotel to be an apprentice of a seasoned Alaska mountain guide. Ever since his father's death climbing Mt. McKinley, he's worked to earn enough money to make the trek to the Alaska territory himself. His father's partner blames their guide for the death of his father, but Allan wants to find the truth for himself. He finds an unlikely ally in Cassidy, and as the two begin to look into the mystery, they suddenly find that things are much less clear, and much more dangerous, than either could ever imagine. Buy the book HERE. Tracie Peterson is the award-winning author of more than 100 novels, both historical and contemporary. Her avid research resonates in her many bestselling series. Tracie and her family make their home in Montana. Visit Tracie's website at www.traciepeterson.com to learn more. Kimberley Woodhouse is a multipublished author and a popular speaker and teacher who has shared the theme of Joy Through Trials with hundreds of thousands of people across the country. Kim is a pastor's wife and is passionate about music and Bible study. She lives and writes in Colorado with her husband of twenty-plus years and their two kids. Visit Kim's website at kimberleywoodhouse.com to learn more.